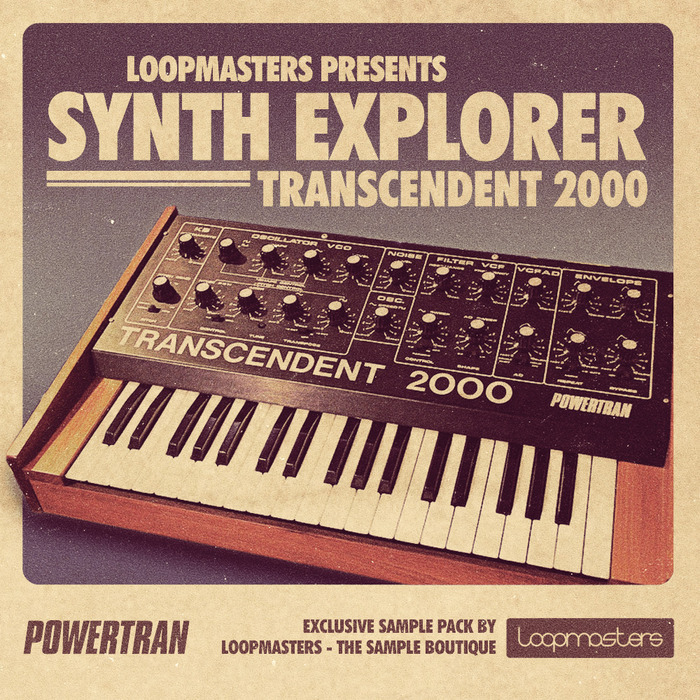 Loopmasters present the next instalment in the exclusive Synth Explorer Series, this time transporting you back to the Shadowplay sounds of the late 1970s and the Powertran Transcendent 2000. Designed by Tim Orr of EMS, this sought after Monosynth was championed by Martin Hannet and Bernard Sumner, making numerous appearances on Joy Divison records and other transmissions produced by Hannett - who reportedly owned five. Focused around 90-140 BPM this pack contains everything you need to bring the dark, derelict sound of the late 70s / early 80s back to life - with a huge selection of inspirational Loops, Single Hits and Multi-Samples. In addition, the Loopmasters Lab Scientists have created a VCF Drum Kit - featuring dynamic movements of the on-board Filters, utilising the myriad of VCF settings and up to Four simultaneous Modulations. Heavy Bass frequencies, rip-snorting Leads and Choppy Synth Sequences will add warehouse atmosphere to every one of your productions. In detail expect to find 537Mb with 632 Wav files consisting of an astonishing 465 Single Hit sounds including: 184 VCF Drum Hits (16 Hats, 31 Kicks, 33 Percs, 29 Snares, 18 Toms, 39 FX and 18 Noise Percs), 105 FX Hits, 33 Bass Hits, 29 Synth Hits and 19 Lead Hits. Then we have 167 Loops including 63 Sequenced Loops, 41 Drum Loops, 33 Music Loops, 15 Bass Loops, 10 FX Loops and 5 Percussion Loops. In addition to the Loops and Hits, 8 Multi-Sampled Instruments are provided so you can play this classic synth for yourself. 104 Sampler Patches are also provided, ready for you to take control in NNXT, Halion, Sfz, Kontakt and Esx24 formats. LFO - 1 LFO can modulate Pitch, Pulsewidth & Amplitude. Synth Explorer: Transcendent 2000 is perfect for adding elements of darkness to a host of Genres including Techno, Breakbeat, Ambient, Hip Hop, House, Chill Out, Electronica, and Trip Hop.